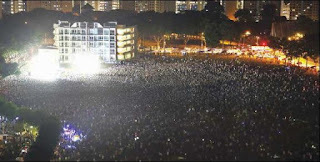 The mainstream media played an important role in People's Action Party's landslide win GE 2015. While there's nothing wrong with the mainstream media's explaining Government policies and programmes, MediaCorp (Channel News Asia's parent) seemed to think that viewers need to be told again and again over several weeks. Coincidentally, the broadcasts seemed to have ceased shortly after polling day! PAP rallies were reported in the front pages of TODAY; Opposition rallies were dealt with further inside the newspaper. 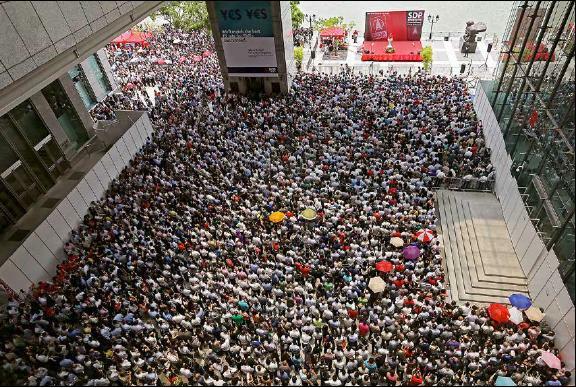 PAP rallies were prominently covered in the print media and on television. 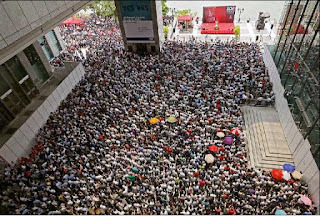 Pictures like these showed, or gave the impression, that The Workers' Party's and Singapore Democratic Party's rallies attracted huge crowds, as big as or even bigger than PAP's. However, unlike the people at PAP rallies, most of whom seemed to be PAP supporters, not everyone at the Opposition parties' rallies was supportive — not outwardly at least — of the Opposition parties. 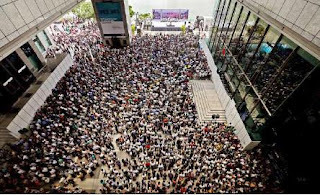 Possibly, some or many of them went with an open mind to listen and form their own conclusions; they didn't go to the PAP rallies because they already knew PAP, having been bombarded incessantly by the mainstream media. What was surprising was that there were hardly any pictures of crowds at the other Opposition (i.e., non-WP and non-SDP) parties' rallies, which might have led (or misled) the uninformed into thinking that all Opposition parties' rallies were similarly well attended, when the opposite was true; even on 4 September (a Friday night) and 9 September (the last day of campaigning) the crowds there numbered in the embarrassing hundreds or the low thousands. These combined to put concern or fear in the hearts of the swing voters that they might cause PAP to lose its majority in Parliament. TODAY managed to find S Rajaratnam School of International Studies Associate Professor Alan Chong to describe National Solidarity Party's about-turn on MacPherson SMC as the result of "petty politics" that is typical of the Opposition landscape, in that there is "the reluctance to give up a window of opportunity as soon as it appears". The mainstream media even published an anonymous poison pen letter alleging, but without providing verifiable evidence of, WP candidate Daniel Goh's extra-marital affair. I doubt if it would have done the same to a PAP candidate. "[W]hen there is suspected wrongdoing, I think many believe the PAP will get to the bottom of things and account to people. Whatever its faults, the PAP retains that trust among voters. The WP unfortunately has given the impression that its way of coping with charges of possible civil or criminal liability is to deny and deflect. Singaporean voters cut opposition parties a lot of slack, understanding the difficult political terrain they operate in. But it's time to raise the bar, and demand more, when there is an opposition party already in power at the municipal level running town councils." Ms Chua forgot about the town council management system affair involving the PAP-managed town councils. 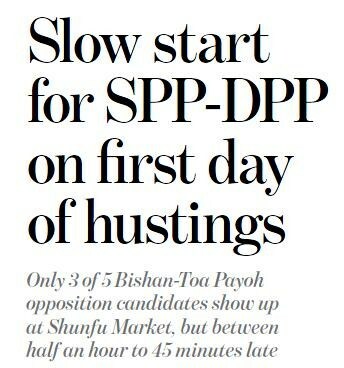 Ms Chua also wrote about why she wouldn't give SDP's Chee Soon Juan her vote because of a lingering distrust of him. Her opinion piece GE2015: Thoughts on Cooling-off Day appeared in paper's print edition on cooling off day. MediaCorp presented the respective parties' political broadcast twice. 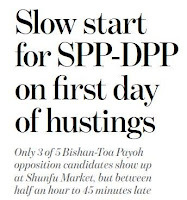 Although MediaCorp's practice has been to allocate time to each party based on the number of candidates it is fielding, this favoured PAP and has no justification. Channel New Asia was so deferential to PM Lee that when he arrived at Ang Mo Kio Stadium, the producer of Singapore Votes 2015 — Results interrupted its "live" broadcast of the returning officer's announcement of the results of Hong Kah North SMC. Even if Mr Lee had wanted to speak to Channel News Asia's reporter, it would have been inexcusable to interrupt the "live" announcement of the results of any electoral constituency because the results were the main if not the only reason that viewers stayed up to watch the programme. In this instance, Mr Lee was simply arriving at the site! Later, when MediaCorp's reporter asked Mr Lee for his comments and he told her (or him, I don't recall), to wait for his press conference, the reporter apparently did not, or did not dare to, press Mr Lee further. Compare this to MediaCorp's reporters pressing Opposition candidates for their responses. Although these took place after the votes had been cast, they showed the stark difference in the mainstream media's treatment of PAP on the one hand and the Opposition parties on the other.